It’s a scary time for vine growers. We need half-decent weather at the right moment or the size and quality of crop could be at risk. 2013 is the latest flowering we’ve witnessed and, what with sunshine one day and unseasonably heavy downpours the next, it’s the stuff of nightmares. Visitors to Vinexpo, the huge trade fair that’s taking place in Bordeaux this week, can see the flowering for the first time ever during the show – if they have the chance or the inclination to get out into the vines. Normally, between 16 and 20 June, you’d have missed the floraison and the annual Fête de la Fleur, held this year at Chateau Lagrange in St-Julien on the 20th, is supposed to celebrate the end of the flowering, not the middle of it. The floraison began around 2 or even 3 weeks late around 8 June, starting in the earlier-ripening vineyards of Pomerol and Pessac-Léognan. The ’later’ vineyards of St-Emilion and the Médoc followed suit a week later. It’s all extremely retarded after a wet and absurdly chilly May, when the average temperature in was 12.5°C – more than 3°C below the 30-year average for the month. We then had a sunny first week of June, then heavy rains on Saturday 8 June and more rain on the 13th. It’s late for sure but it’s the timing and amount of rain we’re having that will play havoc with the crop. Spirits were raised with a mini-heatwave for the opening of Vinexpo on Sunday 16 June but dashed by heavy rains the following night. 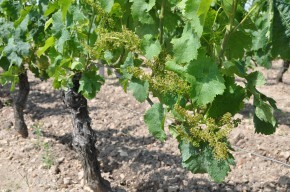 Rain now, with so many vines in flower across the entire Bordeaux region, is not good news. 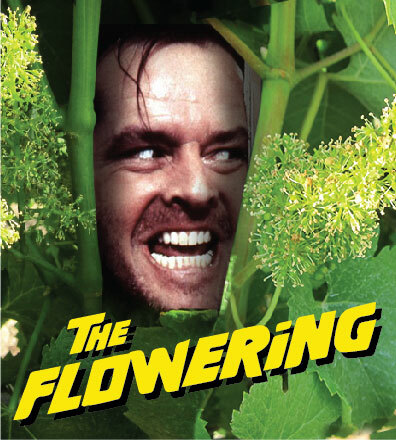 The flowering is hardly a spectacular event. You have to get quite close to see the tiny caps in the process of falling off, revealing the (male) stamens opening out around the (female) stigma. Pollination, when pollen grains land on the fragile stigma, is less likely to happen when it’s cold and wet. If the ovaries aren’t fertilized then the seeds of the berry won’t be formed. Coulure and millerandage – when the baby grapes don’t take shape properly – is bad news all round. Figures vary – I should point out that these figures come from my local weather station, some 15 miles SE of the city. 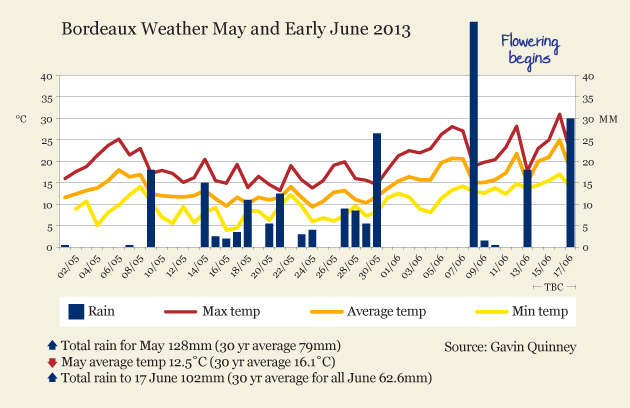 The rainfall on 8 June varied from 72mm here, 104 in Pessac-Léognan, 56 in St-Emilion, 46 in Margaux, 61 in the middle of the Haut-Médoc at Cussac and just 27mm in the north of the Médoc appellation at Bégadan. The growth of the vines is much slower this year on top, as the graph below demonstrates. The height of the feuillage is important – the vine needs enough leaves to create the sugars through photosynthesis. Bear in mind that whereas 2011 was an early harvest, 2012 was considered a late vintage, with all the red grapes being picked in October. Given the lateness of the flowering, the slow development of the vines, and now the amount of rain at this crucial stage, we’ll need a miracle or two for this vintage to be a very good one. With rainy weather forecast for this week, the chances of poor fruit set are increased. Damp and cool doesn’t help one bit, as the grapes struggle to become fertilised. Coulure and millerandage – when the baby grapes don’t form properly – would be bad news all round. 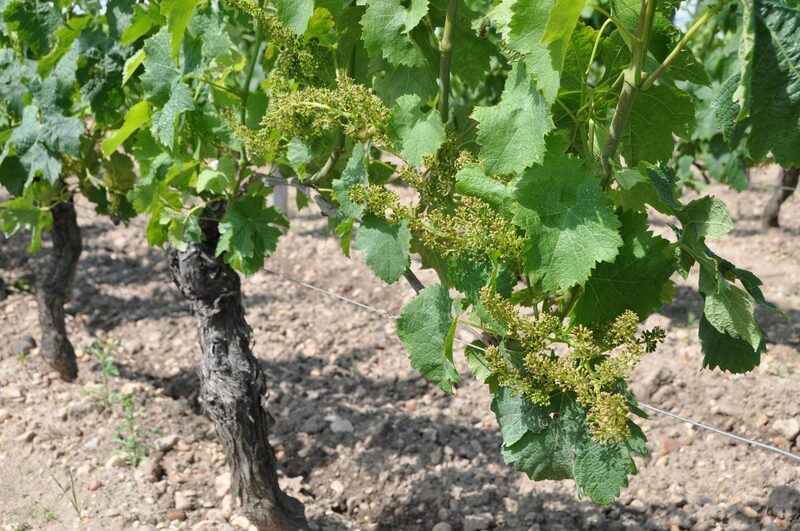 Below are some photos of the flowering – see how Petrus 2013 compares to last year, not forgetting that 2012 was late. Lionel Caillon, vineyard manager of Petrus, 12 June 2013.